Bryn Halliwell from Clyde and Scott Morrison from Aberdeen have been snapped up by Jim Leishman as he aims to keep Dunfermline in the top flight for another campaign. The last Morrison that was signed from Aberdeen turned out to be a great! Halliwell became Jim Leishman`s first signing since his return to the job of team manager. Signed from Clyde on a free, the 24 year old could well find himself first choice keeper if Derek Stillie gets his wish to continue his legal career south of the border. Initially signed as back up to Stillie, Halliwell may soon find himself as the most experienced keeper on the books. He started his career with the club then known as Wimbledon back in 1999/00 season. The Epsom born 5`11" keeper never made a first team start for The Dons, but was snapped up by Clyde in May 2000. Scott Morrison and Barry Nicholson will be wearing opposite jerseys next season! 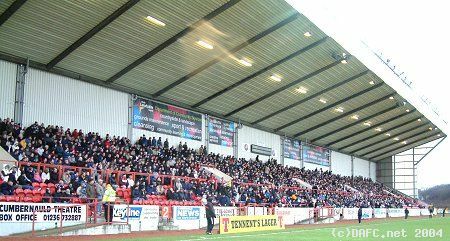 Since then, he has made the number one jersey his own at the Broadwood based club. 174 appearances later, including two as a substitute keeper, for the club, he has found himself consistently winning awards at both club and division level. At such an early age, Halliwell now has the potential chance to make a name for himself in the top flight and we wish him all the best in his quest to become the Pars number one. Whilst the Barry Nicholson transfer saga to Aberdeen went on for what seemed like an eternity, Scott Morrison was quietly heading in the opposite direction. Born in Aberdeen in 1984, the 21 year old has found himself more in favour at international level than at his home town club in recent times. Since having the audacity to question Jimmy Calderwood`s training ground methods, or lack thereof, he was quickly banished from the manager`s thoughts and has found himself looking out for another club ever since. 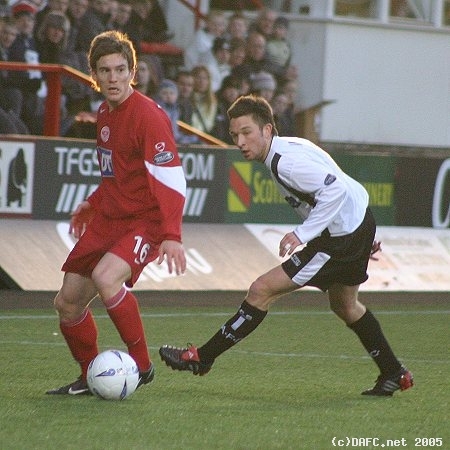 Signed by Dunfermline on the 23rd May 2005, Morrison has previously made 48 first team appearances for The Aberdonian version of The Dons, eight of which have been from the bench. With one goal to his name, the predominantly left back during his time up North has never been one to threaten the opposition goal. However, reports so far seem to intimate that Leishman has thoughts of playing the youngster further up the park on the left. With little, or perhaps no, money to spend in the transfer market, Jim Leishman will have to rely on such pedigree young free transfers to secure the top flight future of Dunfermline Atheltic football club. With new strikers still a high priority for the club, as they have been for the past year, any budget will no doubt be quickly swallowed up by any such acquisitions. Leishman has certainly shown that he has an eye for a bargain in the past, here`s hoping that the two new signings to Dunfermline Athletic will go on to prove their true worth in the seasons to come. Welcome to The Pars, Bryn and Scott.